Radha Nicholson | Pauenhof e.V. This silent vipassana meditation retreat will include in-depth instructions, guided meditations, daily dharma talks, open inquiry sessions, and regular one-on-one meetings with the teacher. It is suitable for both new and experienced meditators. The retreat will offer the opportunity to deeply and patiently explore our minds and hearts in a caring and supportive environment. This retreat invites us to relax into silence, reconnect with nature, and playfully explore the meditations so that we can liberate ourselves from old habit patterns and nourish fresh insights and perspectives. The retreat will start with a walk through the nearby forest to allow the group to talk and connect before committing to silence throughout the retreat. Each morning, guided yoga and mindful movement sessions will be offered as a support for the meditation practice. On the last evening of the retreat, music will be played in the meditation hall and everyone who wishes can dance for a few hours. 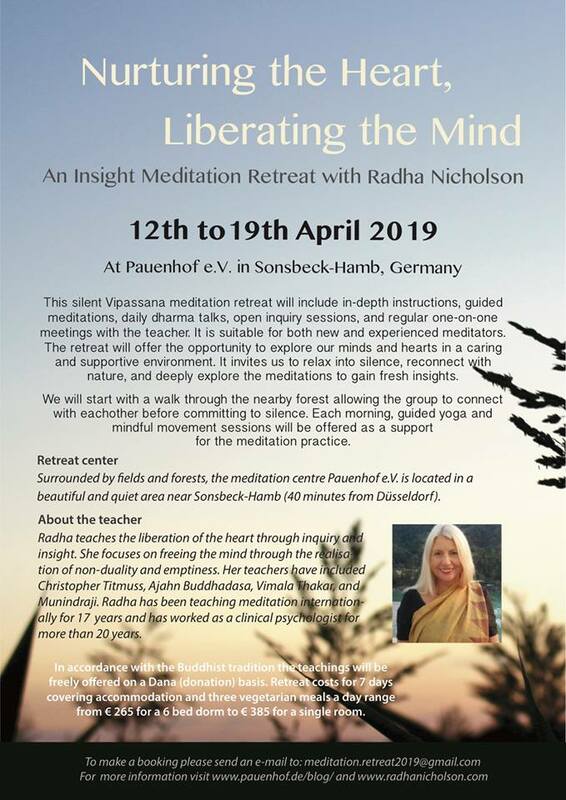 Surrounded by fields and forests, the meditation centre Pauenhof e.V. is located in a beautiful and quiet area near Sonsbeck Hamb (40 minutes from Düsseldorf). The closest train stations are Alpen and Geldern. Radha teaches the liberation of the heart through inquiry and insight. She focuses on freeing the mind through the realisation of non-duality and emptiness. Her teachers have included Christopher Titmuss, Ajahn Buddhadasa, Vimala Thakar, and Munindraji. Radha has been teaching meditation internationally for 17 years and has worked as a psychologist in the treatment for substance abuse disorders, anxiety, trauma, and depression for more than 20 years. The retreat costs cover accommodation and three vegetarian/vegan meals per day. Single and double rooms as well as dorms are available. Thus, costs will range from 265€ to 385€. To register, we ask for a 50€ non-refundable deposit (included in the costs above). This deposit will be used to cover the rent of the meditation halls and part will be donated to the Animal Welfare Fund maintained by the Centre for Effective Altruism. 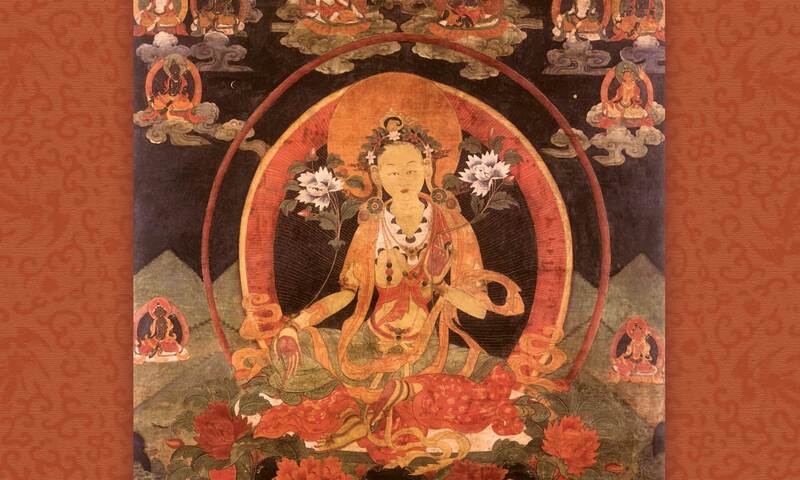 The teachings themselves are offered on a Dana (donation) basis in accordance with the Buddhist tradition of making teachings freely available.